A very powerful piece of theatre was on display at The Lowry Centre in Salford, one that is an expression of our times and a direct challenge to our modern taboos and anxieties. This is not art that is imaginative, virtual, or creative, if by these terms we mean some form of fiction or installation that reframes or reshuffles our perceptions as many modern art exhibitions are intended to do. DV8, the group performing this work internationally, is celebrating 25 years of physical theatre and the experience and directness count. This is direct, physical theatre-dance that enacts important social and political themes and keeps moving and entertaining so the eye is distracted but not the mind. The evening begins not with sitting in the theatre but immediately you purchase your programme which in this case is deliberately too large to hold comfortably in the hand and forces you to explore it. Extensive reading is required if you want to prepare yourself for the evening and its disturbing content, and it is more than a souvenir but also an artefact you can take away and revisit in depth at a later time. That is one significant aspect of the marketing of DV8. It is bringing fundamental social issues to our attention in a way that we cannot ignore and which puts the hype of conventional marketing in the shade. It contains a series of articles and list of acknowledgements of interviewees and sources which form the narrative thread of the performance, moving from one witness to another. Can We Talk About This? discusses two of the biggest taboos we currently face. The first is the way that multiculturalism, despite all the opening up to all kinds of minorities, all of which is justifiable and laudable and necessary, also produces the opposite of its intended aim - atomising society rather than celebrating diversity. The second is the inability of the West to deal with the absolutism of Islam in its extreme form, and I am not here referring to its moderate versions, and this is one of the most powerful and explosive contemporary themes in both a literal and a metaphorical sense. The performance begins with Martin Amis’s searching question “Do you feel morally superior to the Taliban?” and the dancer/vocalist continues nagging the audience at the pathetically small show of hands that answer this question affirmatively. What exactly is this physical dance? Imagine amongst the hordes of street performers one encounters at a major art festival like Edinburgh that there are a number of statues which spring into life as you walk past them and burst into action by performing jerky robotic movements. This form of dance makes a similar impact although the continuous action is anything but robotic. It is engaging, thrilling, alarming, contorted even, as performers stretch the physical limits of the stage, by climbing up and incorporating props, walls, other dancers to convey their message. The expression in the body matches the passion and pain of the commentaries so we can see and feel the meaning of the words as the terrible consequences of the abuses of Sharia law become apparent. The appeal of this art form is immediate and visceral. There were a large proportion of teenagers in the audience who were captivated by this visual narrative although some of the significance of the recited monologues and dialogues which accompanied this would have been lost. The company prides itself on producing dance and video - its name sounds as though it is the next version of a DVD - that continually push back the boundaries and finds new ground and new challenges to conquer. The comparison that springs to mind is with an art form such as opera which perhaps was in its heyday in the nineteenth century. Indeed, the work premiered at the Sydney Opera House last year. How so? Opera is a combination of beautiful (Western) sound and theatrical spectacle that at its best explores the human condition in its most passionate, vulnerable, tragic and comic circumstances. It too relies on a combination of sound and vision, although the drama is always expressed in the quality of the sound. However, the narrative can be lost due to the lack of clarity of the diction or the fact that it is sung in a foreign language. In terms of singing, it is equally physical and demanding, but that is internal control and discipline of which the audience is largely unaware. 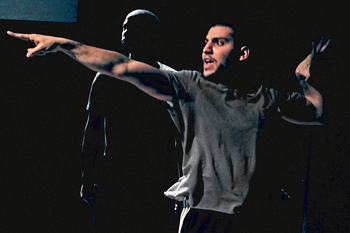 However, with DV8, that physicality, requiring a similar level of discipline, control and precision is external and continually on show to the audience. The real point I want to make about nineteenth century opera (and indeed earlier than this period) is that the best of these works were equally cutting edge and dealt with moral taboos, rigid and hypocritical social values, and the suppressed expression of national democracy. To do so, they often had to set these issues in another place and time to escape state censors - you only have to consider the work of say Verdi to see this in action. We have a far more pernicious form of censorship to contend with today, namely self-censorship and this is exactly what “Can We Talk about This?” is all about. It is partly because we can delude ourselves into thinking that the moral oppression of the nineteenth century and its forbidden subjects no longer applies and that we have made enormous strides in tolerance of different cultures, faiths and our sexual identities which, of course, we have but also at a price. It is far more dangerous in a world of moral relativism not to be able to express outrage and disgust for fear of offence. We think we can confront the elephant in the room simply because we recognise it is there when previously we ignored its presence. It still has the capacity to trample us to death. 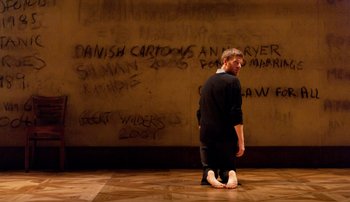 So to give an idea of the range of DV8’s material, it moves through some of the recent flashpoints of Islam and the West such as Salman Rushdie’s Satanic Verses, Theo van Gogh’s murder, the Danish Mohammed cartoons and examines where the effects of Islamic absolutism are causing most damage in British society - from the nearly 3000 cases of “honour” violence in the UK each year to the London School of Economics Students’ Union effectively making blasphemy an offence (according to The National Secularist Society), and there are many more examples for the spectator to absorb. Apart from some other recent cases of Islamic extremist intimidation in an educational context, look up the names of Ray Honeyford, headmaster (whom you might have heard of) or Erica Connor, headmistress (whom you probably won’t know) on your search engine and inform yourself of their plights. Words are not adequate to describe this potent and chilling theatrical event. There is no danger of this writer spoiling the plot as the event has to be experienced to be understood. It is primarily through dance that the message is being conveyed as we live in a predominantly visual age in which if something looks good, it is good. We don’t probe beneath the surface of the glossy marketing or sweeping assertion to examine the validity of its claims. The overlay of the various monologues and dialogues force us to attend intellectually to what we are viewing emotionally. The 10 performers of this work will not be mentioned individually as this is a collective work, and the art is subordinate to the individual voice of protest throughout it. Having the courage to release the self-imposed moral handcuffs is one of the greatest challenges to the freedom of speech and to the clarity, quality and objectivity of our intellectual and moral discussions and decision making. This is not simply a religious question as it applies to the whole range of human activity, religious or secular alike, and to all those who lay claim to a monopoly on truth and squash any form of dissension. It would be interesting to see what DV8 would make of the socio-political impact of the financial crisis and/or the paralysis of the Euro and the European project itself. Translating the obscurity and complexity of the stock markets and derivatives and huge bonuses into dance and their consequences for ordinary human beings would be an intriguing challenge. This work is a must for all thinking people of whatever religious, secular, cultural or political persuasion. Discover more about the background to Can We Talk About This? from DV8's Artisitc Director, Lloyd Newson. Co-produced by Théâtre de la Ville and Festival d'Automne, Paris, National Theatre of Great Britain and Dansens Hus Stockholm.